Alright, it's not super easy to come up with articles to write when we get few polls and the overall situation isn't really changing. Still, let's look at some of the possible scenarios based on the most recent polls and projections. This will also allow us to see how much uncertainty there is currently. I added the new Ekos poll to the average as well as yesterday's Mainstreet tracker (for the daily tracker, I update daily but I thus remove the one from the day before, otherwise I'd be double counting some of Mainstreet data). As I was saying, the overall situation is mostly unchanged. Maybe the only thing worth mentioning is how the Liberals have stabilized. If anything they seem to have slightly rebounded (in terms of votes, not seats however). This means the NDP is still far from being a true challenger to the PC of Doug Ford. When it says "chances of winning" above, it is referring to the chances of winning the most seats. 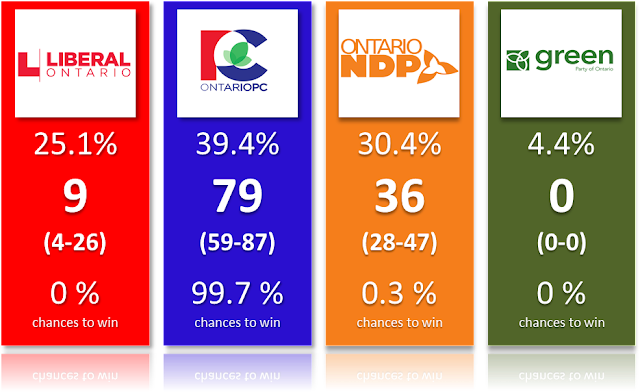 Still, in our electoral system, remember that you can technically win the most seats but not ""win" and become Premier. Obviously, in the current election, that could only happen if Ford was to fail to get a majority. The graph below shows you the various scenarios. The "others" is really just one scenario: a tie between the PC and the NDP. This occurred 2 times out of 10,000 simulations. Also, no, I didn't forget about the OLP. This party simply can't win based on the current information (polls, etc). Not even a minority. The Liberals can, however, be tied with the NDP (22 times out of 10,000). I understand some of you might say "but polls have been wrong before" and they'd be right. But my simulations already include very big variations. Also, the probabilities have proven to work in past elections. So no, I really believe the Liberals would have no chance if the election was tomorrow. 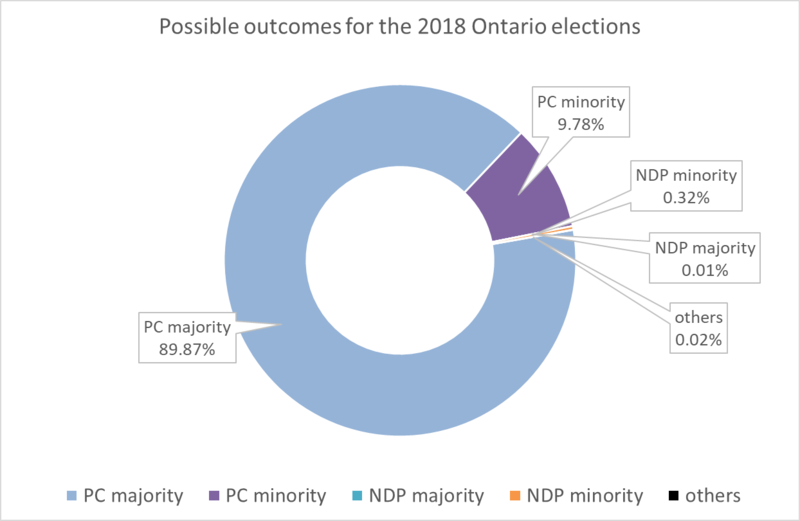 The possibility of a PC minority is interesting. What would actually happen depends on many factors. Would the NDP try to get the support from the Liberals? All the leaders currently say no to a coalition but if the PC was to win a small minority, it wouldn't be surprising to see a possible change of attitude from Horwath for instance. Again however, it'd depend on many factors. Which leads us to the question: can the PC actually win a small minority only? Yes, it's possible. 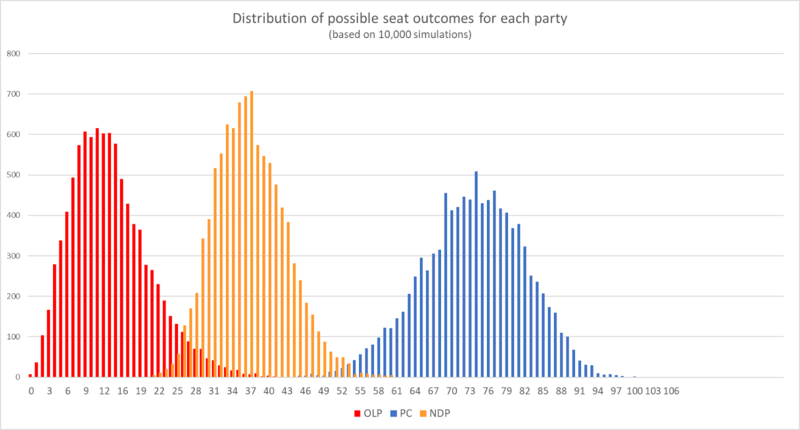 here below is the distribution of the possible number of seats for each party. 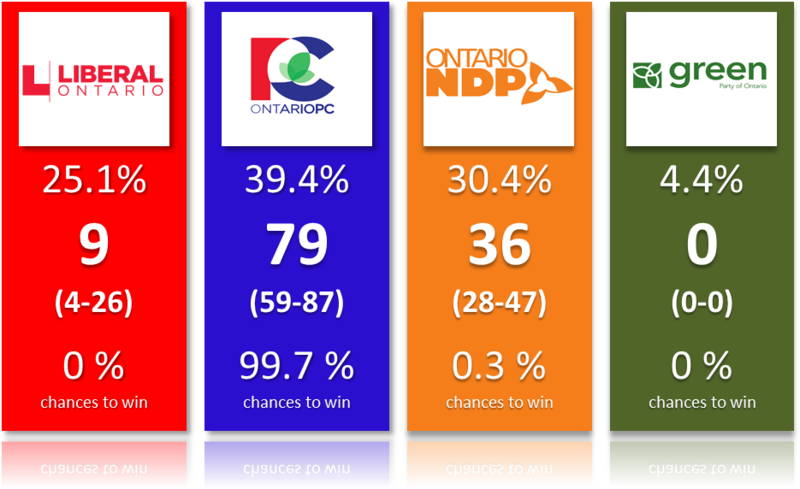 The absolute worst scenario for the PC is at 40 seats. The chances of winning 50 seats and fewer are less than 1%! So right now, even in a scenario where the polls had overestimated the Conservatives and this party had an inefficient vote, it'd still likely win at least 50 seats. At 50 and more, it gets more and more difficult for the NDP and OLP to try to prevent Ford from governing. In other words: this election currently has the least amount of uncertainty I've seen in a long time. Look at the distributions, they barely overlap. This means we have a high confidence that, if the election were tomorrow, the PC would finish 1st, the NDP 2nd and the Liberals 3rd. Of course, as usual, the election isn't tomorrow. Speaking of best and worst scenarios, for the NDP there are, respectively, 67 and 21 seats, while it's 42 and 0 for the Liberals. The Green could at best get 1 seat (chances are less than 1%). Finally, here is the riding by riding projections.